I was looking for inspiration for our Boxing Day bundt. With it being the festive period, I had done my fair share of 'lolling about' (this means being a bit of a slob - this was not intended to be some 'down with the kids/street' way of saying I've been laughing a lot). This also means that we've watched a lot of Vine Comp of the Week. And there it was. Inspiration. For those of you who are unfamiliar with Vine Comp of the week, it is basically a collection of short videos made by normal folk like you and I. Granted, they are mainly of people twerking (at least the first ten), a few horrible fights, cats doing funny stuff or people being ridiculous. I love and hate it in equal measure. One of my favourite videos from said compilation is the cinnamon apple Vine. And there we have a cake. I also suggest you watch the clip. Anyway, the cake. This was one that had to be suitable three ways, on it's own, with cream or covered in custard. As if you put cream on cake... I'm all about the custard. It was really nice served slightly warm too. 50g apple compote, puree or sauce - something sweet. In a separate bowl, measure out the flour, bicarbonate of soda, salt and cinnamon. Pour the yoghurt and apple compote into a jug. When the cake is fully cooled mix the icing sugar with enough apple juice to make a pretty runny icing. Tip it over the cake and let it run down the sides. I also added a few sugar lumps and a bit of glittery icing sugar. Can you believe I've had this tin for two years and done sod all with it? 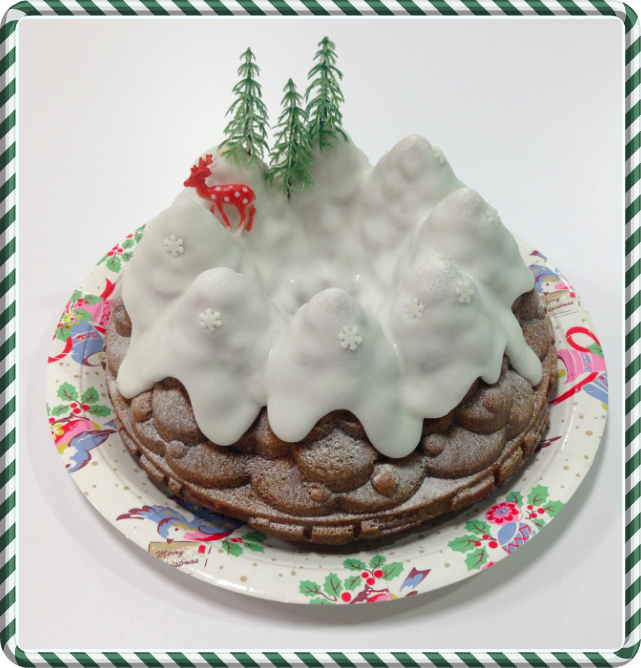 Whilst I was in full 'festive baking mania' this week, I decided to have a bash. 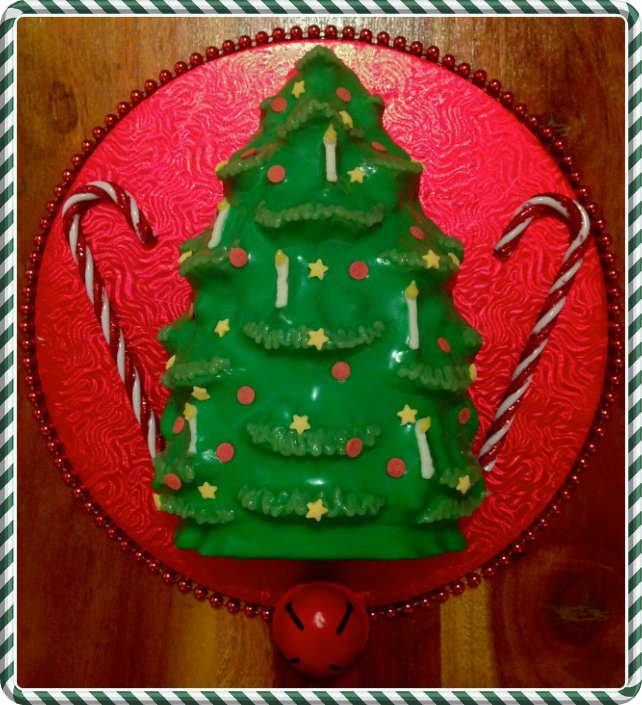 It was ridiculously easy to pop out of the tin and a splash of garish icing later and I had a wonderfully kitsch Christmas cake! You don't have to make it neon green, but I found it helped to get me in the Christmas spirit. Christmas was never a tasteful affair when I was a kid... Still isn't to be honest. My mother has a pink tree with some of the most evil decorations you've ever even seen. 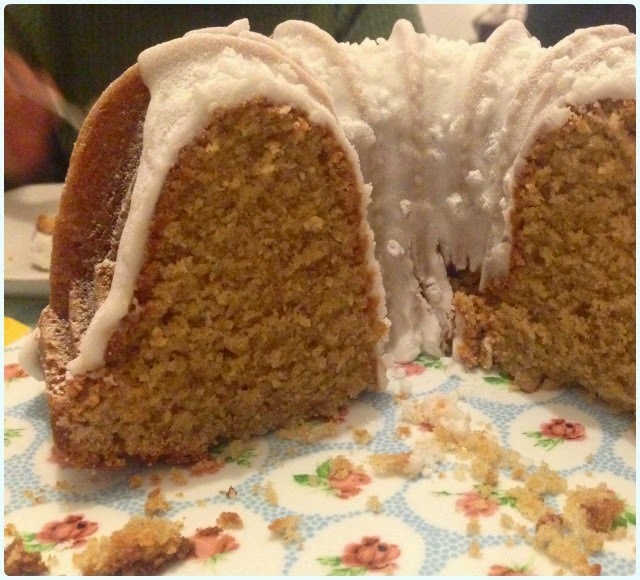 This one's a lemon and ginger flavoured cake, but you can really use any bundt recipe you like. 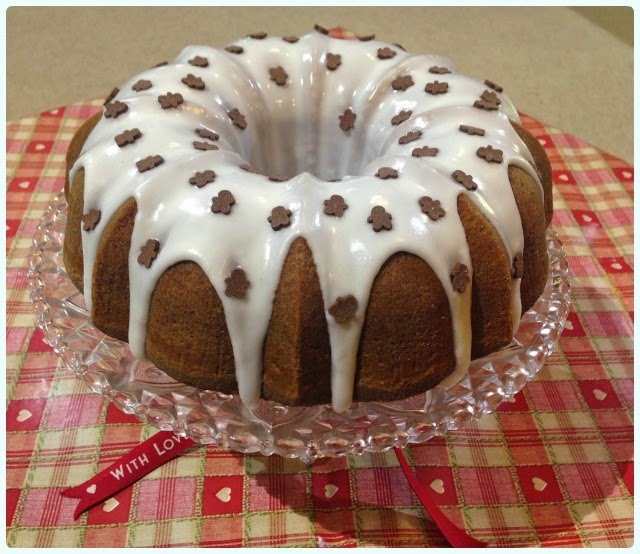 This recipe is for a regular sized bundt tin - 2.4l, 10 cup, 10 inch. The tin I used is a Nordic Ware one and is about 6 cups, so I put the excess batter into bundtlettes. Prepare with Cake Release spray and dust with flour. In a separate bowl, measure out the flour, bicarbonate of soda, salt and spice. Pour the yoghurt and zest into a jug. When the cake is fully cooled mix the icing sugar with enough water to make a pretty runny icing - dye it green. Decorate with sprinkles and icing pens to get the same effect that I did. 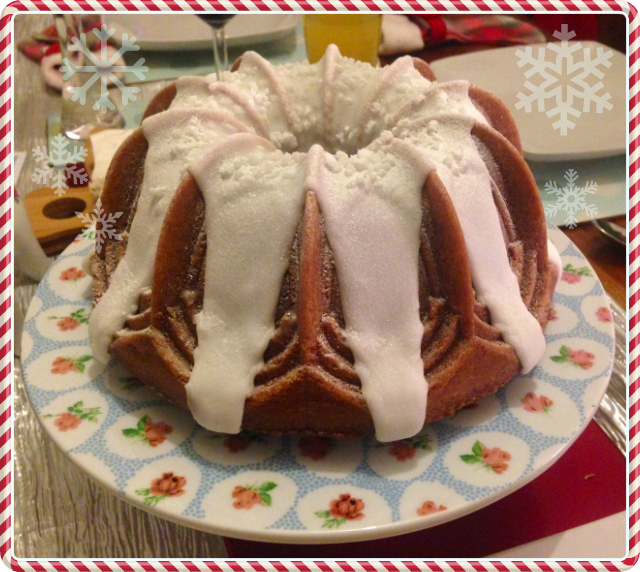 It's Nordic Ware's signature Christmas tin - the Holiday Tree Bundt. Thrust to fame by Nigella, it was my first (of many) festive tins, which have to make an appearance every year. This cake was for one of our work buffets because it's perfect for feeding a crowd. It fills the room with the aroma of Christmas and is great for those who have a mortal fear of dried fruit - of which there appears to be an increasing amount. It's also an ideal recipe for releasing from a detailed tin with no worries about losing the pretty design. In a separate bowl, measure out the flour, bicarbonate of soda, salt and spices. Pour the yoghurt, zest and juice into a jug. When completely cool, mix the icing sugar with enough water to make a thick icing and tip over the cake. If you've used a tree tin like me, make it look a bit like snow! Sprinkle with 'snow' (dry icing sugar). This was a bit special. 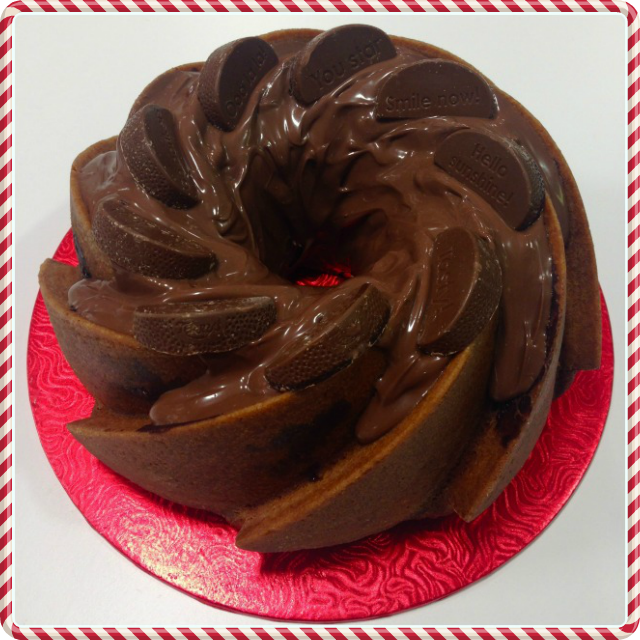 Anyone who follows my bundt escapades will know I'm not mad keen on chocolate cakes. I find them a bit boring to be honest, and often a bit stodgy or dry. Not this one. No my friend. This recipe has been doing the rounds in my head for a wee while, so I decided to get it out there. Even I loved this cake. I caned two pieces within about 15 minutes! I didn't want to overdo the chocolate orange flavour, so stuck with an orange flavoured sponge, marbled it with chocolate and then tipped a load of melted stuff over the top. I added individual segments to decorate, which also had pleasing little slogans on them like 'You're gorgeous' (cue Baby Bird being stuck in your head). 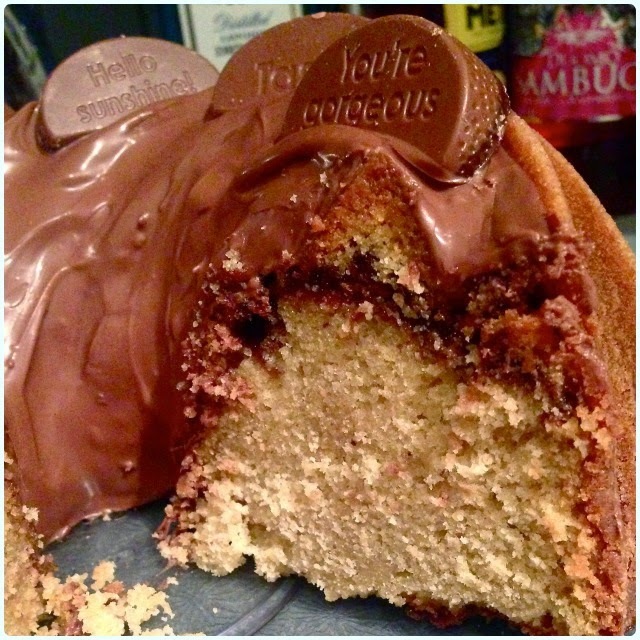 What's even better, is that this cake is mega easy to make and everyone will think you are well clever... It smells pretty special too. Cream the butter and sugars until pale and fluffy. Pour 3/4 of the mix into your prepared tin. Dollop 5 tbsp of the chocolate spread over the mix and smooth out - avoid the edges. Because this is smooth, it will sink - this is ok! Cover with the rest of the mix. When the cake is fully cooled, warm the rest of the chocolate spread in the microwave until runny, and tip over the cake like a Christmas elf high on candy canes. Pop your chocolate segments on top. How cute is this tin!? 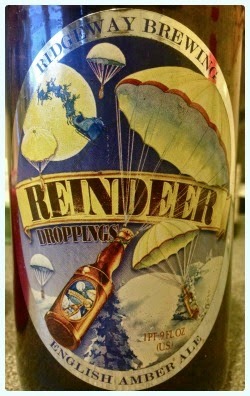 This cake was inspired by a random bottle of Christmas ale that I found in the cupboard. I feared that it would never get drunk, so I emancipated it and turned it into something wonderful. I used a cocktail of festive spices to liven it up a bit, which made the house smell utterly heavenly! 1 spicy tea bag - I used Betty's Christmas tea, but a nice Assam or Chai would work. Grease and flour a large loaf pan (minimum 2lb) - I used the Nordic Ware Gingerbread Loaf tin. Only fill 3/4 full. Brew a strong cup of tea and discard the bag - do not add milk. Tip in the sultanas, cover with cling film and leave to soak. Leave these as long as you can. Add the extracts to the beer. Give the whole thing a quick whizz for about 10 seconds or until well combined. It will no longer look terrible. Drain the sultanas and pat dry with some kitchen roll. Dust with a little flour. Spoon 3/4 of the mix into the prepared tin then layer on the sultanas. Spoon over the rest of the mix - this will stop all the sultanas sinking to the bottom! Bake at gas 3/160 C for about an hour and fifteen minutes. Just turn it after about an hour. It should be shrinking from the sides and a skewer should come out clean. Allow to cool fully before decorating. I just used piped royal icing with a few sprinkles to accentuate the pretty design. I feel like Solita was one of my first loves. I remember when a trip to Manchester was bleak in terms of decent lunchtime haunts, which usually meant grabbing something on the way home. Now look at it. It's bursting at the seams with enough restaurants to keep me fearing the onset of gout for at least another 20 years. Solita was the game-changer. Franco and his team launched with a bang, and brought the pulled pork sundae, Big Manc and deep fried coke to the City centre, and for this I will always be eternally grateful. 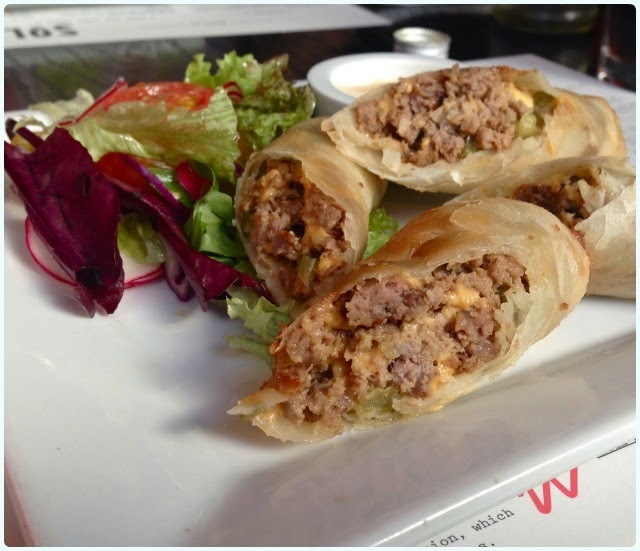 Cheeseburger spring rolls - I could eat my own bodyweight in these. They are the future. Veggie options - Paddy decided to put the veggie options through their paces. They were so good that he declared this food the best he has ever had at Solita. Coming from a carnivore who likes his steak blue, this is high praise indeed for somewhere that is famous for a meat-fest of a burger. 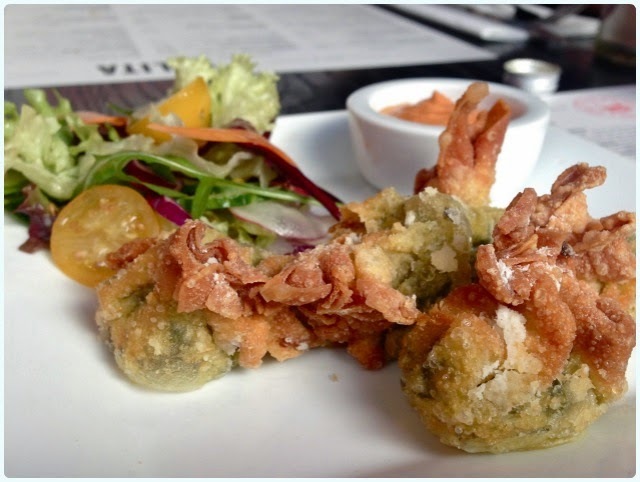 Deep fried spinach and artichoke money bags: I would never have ordered these (my preferred option is below...), but I did steal some of Paddy's. Loved them. Crispy little parcels of wonder made even better by that red pepper dip! Cheeseburger spring rolls: I will dream of these forevermore. If they ever stop doing them, I will find the person responsible and make them listen to Steps on repeat until they promise to bring them back. They genuinely taste like a cheeseburger with a crispy coating! The addition of little cubes of pickle inside was just genius. Bravo! Roasted veg and halloumi skerwes: Halloumi cooked in an Inka grill - good god. Delicious! I would happily order this as a main in future (minus my mortal enemy beetroot of course). You really don't miss meat when you get that barbecued flavour from the Inka. 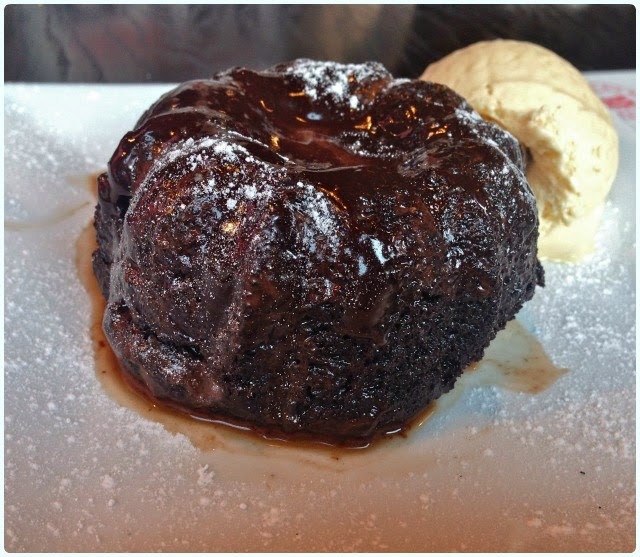 Molten individual chocolate cake: It's a bundt! I'm not a chocolate cake kind of girl because I often find it a bit hard work, however I couldn't leave without ordering this. I was pleasantly surprised by how light this was, but have to confess to only eating about half due to previous levels of gluttony. I've already seen the Twiter chitter-chatter about some of these dishes - the Solita team have done it again. Take a bow folks. 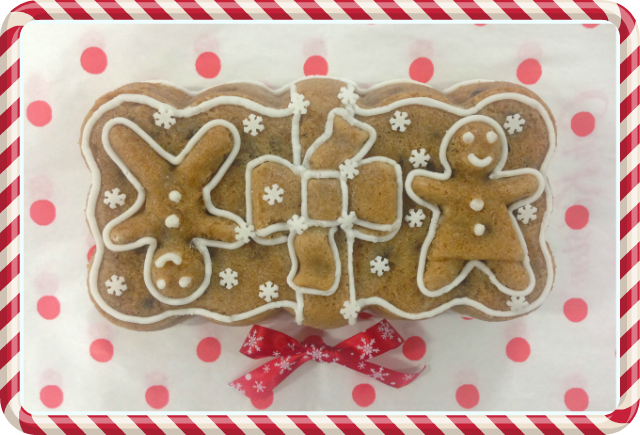 How ace is Christmas baking?! I'm not a fan of the standard mince pies and rum laced fruit cake combo, but I do love something spicy, scented with all things festive. Last week's cake club theme was 'Winter Wonderland', and was the perfect opportunity for me to crack open the Christmas sprinkles! This simple bundt cake is living proof that you don't need to go all 'sugar-paste mental' to make something which is as pretty as it is tasty. I got these cute little gingerbread man sprinkles from the Cake Decorating Store. I resisted using one of my seasonal tins (for now) in favour of my trusted Anniversary tin so I could show off the decoration. In a separate bowl, measure out the flour, bicarbonate of soda, salt, spices and crystallised ginger. Sift in a third of the flour mix followed by half the yoghurt. Repeat this until everything is combined. The crystallised ginger will be trapped in your sieve but covered in flour - this helps to stop it from sinking. Stir the ginger chunks into the cake mix. When completely cool, mix the icing sugar with enough lemon juice to make a runny icing and tip over the cake with enough festive giddiness to do the trick. Sprinkle with little ginger men. Ho ho ho! 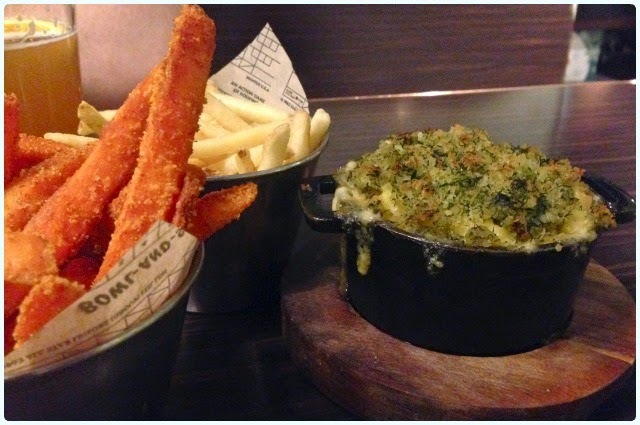 Last week we went to discover one of the true meanings of Christmas... FOOD. Let's face it, we all love to feel like a stuffed turkey by New Year's Eve, and it's a quintessential tradition to curse your own gluttony and vow to become a teetotal powerhouse of physical fitness on 1st January. Just run with it - you do it every year. 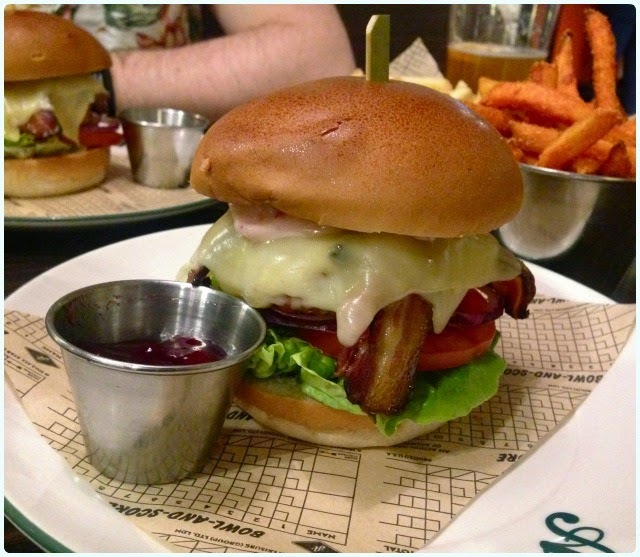 So, let's start as we mean to go on, mainly in the form of a towering burger packed with all things festive! 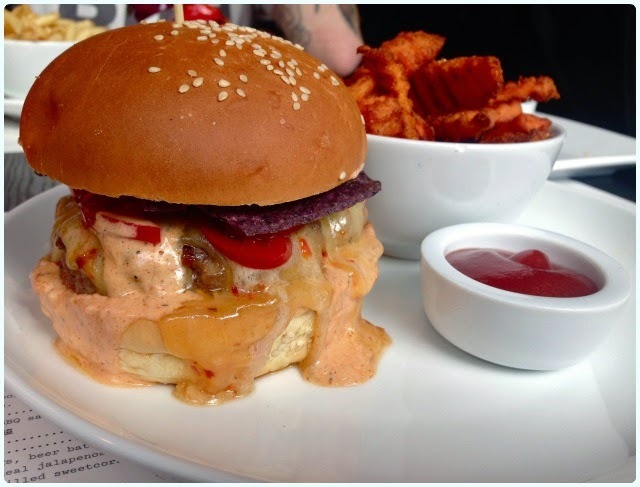 The current All Star Lanes special is the Turkey Burger, which actually sounds quite healthy! This pile of festive fayre includes a breaded fried turkey breast, sage and onion pork stuffing, Monterey Jack cheese, Porter cured bacon, cranberry sauce and mayo. It's the kind of burger that you have to do a firm squashing manoeuvre on before you can fit it in your mouth and rue the day you didn't put your napkin on your lap. I loved the fact that the stuffing forms part of the breaded burger too. Because it's turkey, it didn't seem to kill me off either; it genuinely seemed like a bit of a lighter option (I'd been to Solita earlier in the week...)! I'm fast becoming All Star Lanes' biggest fan. I love the decor, the food, the cocktails and the people. 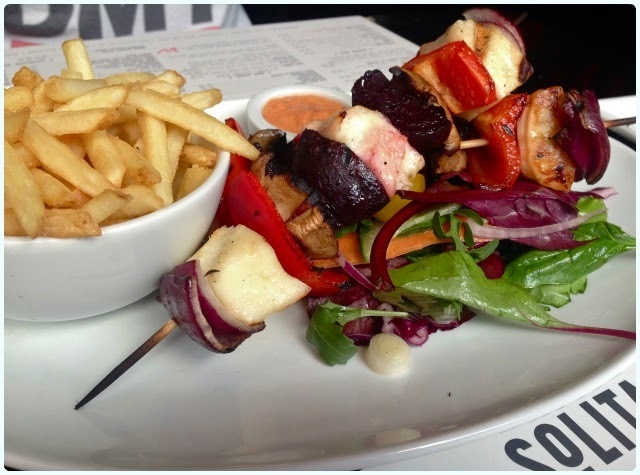 We always have a great time and they are constantly coming up with a fun new twist to the menu. Go here with friends for a great night out and some lovely food to boot. If you do decide to go bowling, you will not see our scores on the leaderboard - some say it's because we're crap, but that's just an elaborate cover story concocted by the staff so other bowlers don't feel intimidated.